Page 45 Wins Nottingham Independent Retailer Award! Oh, you lot are amazing! As announced on Twitter on Wednesday 15th August – with a typically belaboured drum roll – and confirmed on Saturday 18th in the Nottingham Post, Page 45 has won the first-ever Award for Best Independent Retailer In Nottingham. That’s pretty nifty in so many ways, and we couldn’t have done it without you. Just like the only ever Diamond Comics Award For Best Retailer In The Country back in 2004, the judges may have judged because that’s what they do, but it was you taking the time and trouble to vote that brought us to the attention of the captains of commerce in the first place. You got us into the vital top five. Thank you! It’s nifty for us because it means free publicity, extra opportunities and a self-esteem upgrade. And let me tell you, we have seized those opportunities you helped provide. After visiting as a judge Mel Cook, editor-in-chief of the Nottingham Post, offered Page 45 its own monthly slot in Nottingham Weekend to promote whichever graphic novels we want in whatever fashion we choose, and I started last Saturday 11th with Shaun Tan’s THE ARRIVAL, perfect for such a multicultural city, rewriting what you see there to fit an audience that knows nothing about comics. I’ve already chosen the next book which appeared just last month and its reviews is brand-new. What an opportunity to fulfil our primary goal of bringing quality comics into contact with the Real Mainstream! Poor Lynette Pinchess, though: the fully fledged feature writer who wrote this peerlessly eloquent article on Page 45 – and so may have been responsible for that column – has now become my personal editor. Thanks to the efforts of Dianne Allen at Gemini PR & Marketing who oversaw the Nottingham Independents campaign, Mel also offered me a slot to respond to the award by writing about the vital importance of Independent Retail in an otherwise homogenised High Street. You’re bored of that phrase aren’t you? Well, unless we do something about the insidious encroachment of the corporate giants obliterating all individuality, I think you’d better get used to it. 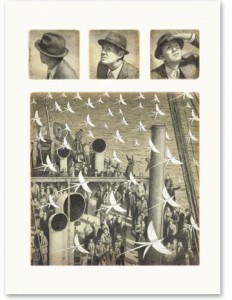 Oops, here it is – almost as I wrote it – originally entitled ‘The Stuggle For Indepents’. It’s also cool for comics because in a country where the medium is still frowned upon by the majority of the Real Mainstream, Nottingham’s establishment, suited and booted and tied-up to the max, has now recognised the art form in public and commended our efforts to bring its diversity to everyone most emphatically. They’re always calling, Jennifer. Even while you sleep. With a single tweet we gained sixty sympathisers in twenty-four hours, including Jennifer Spencer. Lucky us, but pity the fools. They’ll get used to it eventually. 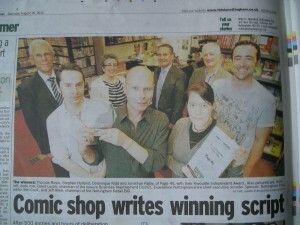 This: getting local comicbook talent covered in the Nottingham Post. They probably don’t even know we have national and indeed international stars in our midst like D’Israeli, Ian Culbard, Philippa Rice and Luke Pearson. But maybe with my foot in the door, we can change that…? I promise you I will try. Interviews etc.! BBC Radio Nottingham rang. This Wednesday 22nd August Jonathan and I will be recording a programme dedicated to Page 45 and comics in general. Don’t know when it will be airing yet, but you can sure that the time will be tweeted. There will be no “Biff, Bang, Pow!” unless I start punching people for dwelling on superheroes. 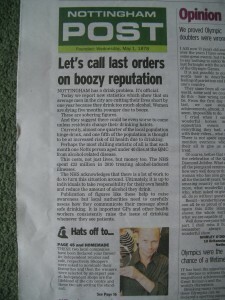 Do you have a copy of August 18th’s Nottingham Post? Tom texted me to take a look two pages prior to our proper appearance and sure enough on page 14 there is a second similarly ghastly photo of ghoulish old me underneath the headline, “Let’s call last orders on boozy reputation”. *It’s funny: I only took the Comics International gig – offered thanks to THE COLDEST CITY’s Antony Johnston asking me to write a Page 45 guest editorial for Ninth Art back in 2003 (take a look around while you’re there!) – as an act of subversion in order to undermine its dire direction and smothering focus on superheroes with an injection of Real Mainstream material. Now I get to infiltrate a proper newspaper read by the Real Mainstream and present them with the graphic novels which I know they will love. Far more at home, cheers. Speaking of Nottingham Independents, this is where I took my first archery lesson last week: Woodland Farm Complex – they do archery, fishing, shooting. I cannot tell you how entertaining Daniel is. Also: relaxed, encouraging even to idiots like me, and flexible with his hours. I rang, he asked when, I said 2 to 3pm Friday and he said yes. Me and my Ma for £12, as simple as that. Any day of the week so long as they’re not already busy. It’s in the heart of the countryside west of Mansfield and five minutes east from junction 28 of the M1. I took out a fox, a lynx and got the RSPCA on my case – even though they were 3-D models. UK feral lynx population undiminished. This entry was posted on Monday, August 20th, 2012 at 2:53 pm	and is filed under Various, Letters & Other News. You can follow any responses to this entry through the RSS 2.0 feed. You can leave a response, or trackback from your own site.